Screening: Saturday, June 9th, 8 p.m., Rich Theatre, High Museum of Art, introduced by Museum of Modern Art Associate Film Curator, Anne Morra. This Saturday we kick off our summer series Archival Gotham: NYC on Film with a night of short films that span 60 years of the gritty city’s history. Landmark films like On the Waterfront (1954) and Taxi Driver (1976), which will be screened later in the series, bear canonical prestige and boast star-studded casts, but this first night of short films wraps the viewer into another, equally alluring texture of New York experience. The cinematic eye that looks upon roofline buildings in Architectural Millinery (Sydney Peterson, 1952), manhole covers in the aptly named Manhole Covers (Ruth Cade, 1954), and subway tunnels in Interior N.Y. Subway, 14th to 42nd Street (1905) takes in the detail of the city’s visceral body. 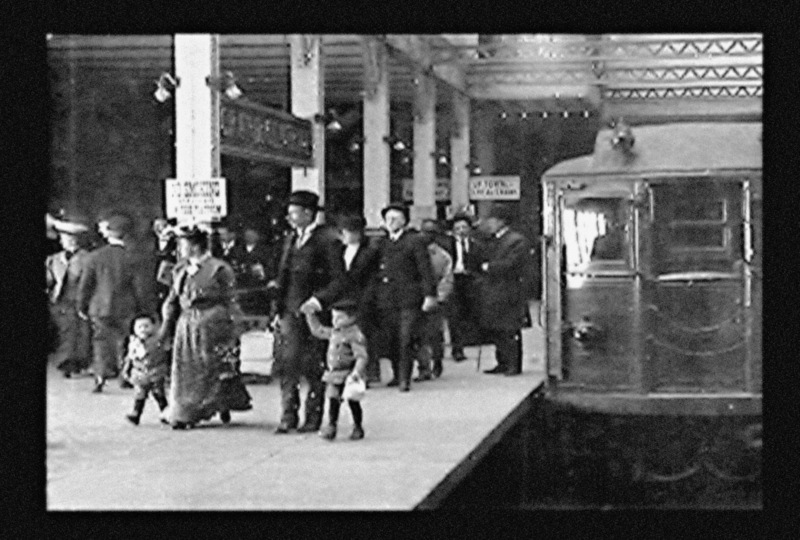 Images of the subway, in the case of this latter film, transform under the strange gaze of a 1905 camera. As the earliest footage of the New York Subway system and as a very early actuality, this four minute film is a historical document that marks a particularly nascent moment in both cinematic and subway history. But in the silent rhythms of shape and light, the film also becomes an abstract aesthetic experience. The image of the train and the glimpses we catch of early twentieth-century Americans scuttling aboard—these historically bound images recede into an endless progression of hexagons, shadow and light bursting and vanishing across the face of the image in a dynamic play of grays and whites and blacks. Every one of the short films screening on Saturday offers up New York as this kind of historical/aesthetic marvel, and in this way these shorts speak most profoundly to the accompanying photography exhibition, Picturing New York: Photographs from The Museum of Modern Art. The exhibition presents 150 photographs from MoMA’s collection which similarly capture the detail and abstract beauty of the city. In addition to the study of the subway, roofline buildings, and manhole covers, the night of short films include John Hubley and Faith Elliott’s The Tender Game (1958), which gives us an image of New York love set to Ella Fitzgerald, while Joseph Cornell’s Flushing Meadows (1965) presents a particularly mournful image of Flushing, Queens. Finally, a nineteen year old Orson Welles and his classmate William Vance give us a Surrealist take on the ceaseless tolling of life’s bells and death’s frenzied grasp in The Hearts of Age (1934). If you’re any kind of Welles fan, you won’t want to miss this chance to see the origins of his wild-eyed performance style as well as a moment of sheer Wellesian depth of field of the sort that would one day make his Citizen Kane a masterpiece.